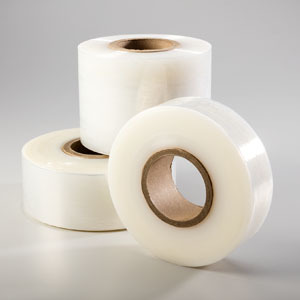 Stretchtape’s machine-grade stretch film is ultra-strong and can stretch up to 200-300% of its original length. Our film has excellent clarity for easy product identification. It also requires less force to stretch and can be dispensed at high speeds. Machine-grade stretch film offers an increased resistance to tears, making it suitable for oddly shaped loads or packages with sharp edges. Our machine-grade stretch film is manufactured using the cast extrusion process and unwinds quietly and smoothly from automated stretch wrappers. This process creates a clear, shiny film which allows for easy pallet product identification. The film has excellent cling properties and is available in both one-sided and two-sided cling packages. 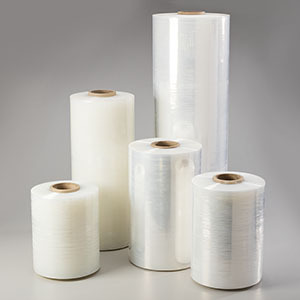 Machine-grade stretch film is best used by medium to large scale warehouse operations given its ability to efficiently wrap products in a minimal amount of time. The film increases profitability among users since it requires less film to wrap the same number of pallets. Besides cast film, Stretchtape offers machine-grade stretch films with different characteristics, including: blown films, high slip films, high-performance films, colored films, heavy duty films, and UVI films to protect the film from degrading in the sunlight. The tear- and puncture-resistant material also has high stabilization strength for tall pallets within any industry. Check out our Colored Stretch Film options to simplify your pallet identification process. 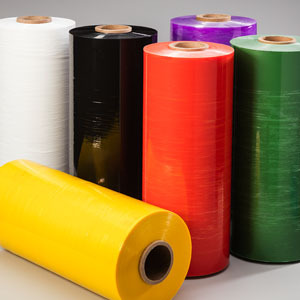 Stretchtape’s machine-grade film comes in a variety of colors as well as specialty films including one-sided cling, UVI, VCI, and anti-static.